New IPs have become rarer and rarer from Nintendo, a developer that used to pump them out on a constant basis with great success. Introduced last year at E3, Splatoon had a tall order of being just that: a new IP on a system that was struggling. Surprisingly, Nintendo also revealed that it was a game which was focused on being an online shooter, something they had never really attempted before. Thanks to some crafty marketing and a user base starving for new content, Splatoon has seemingly proven to be a successful product for Nintendo. By all accounts, it’s been received well by critics and is selling above projections. Unable to shake the game’s inky charm, I secured a copy of my own to put the game through it’s paces. So how does Splatoon fit in Nintendo’s vast library? Will this online focused game prove to be the smash hit the WiiU needs? While I can’t answer that last question, I can tell you about my experiences with the title. So lets inkin’ get to it, shall we? 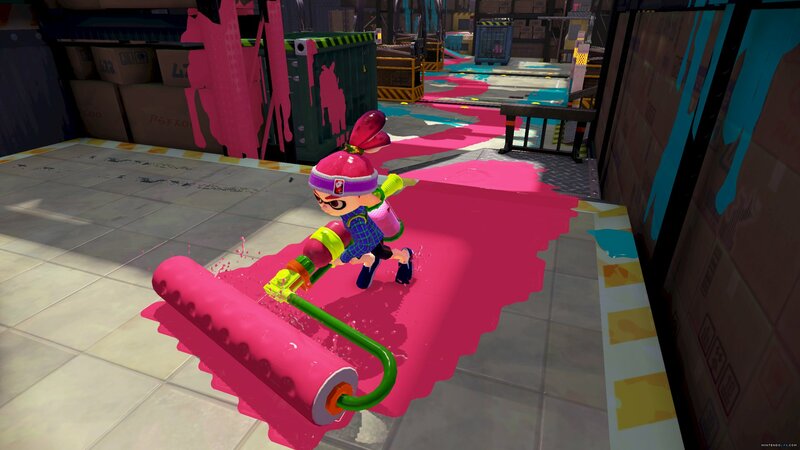 Splatoon manages to hit all of the Nintendo classic notes. It’s colorful, features unique looking characters (who appear to be a squid that’s also a kid), and is incredibly fun. The game has a vibrant cartoon look to it, with the primary objective being to make a mess of stages by shooting your ink all over the place. Seeing that colorful ink sploshing and gooping on the ground is very cool. Better yet, players can transform these kids into squids on a whim, granting the ability to ride through the ink, presenting new traversal options for the player. It’s very easy and intuitive to pick up and play. Even prior to release, there seemed to be a murmur of concern over the game’s lack of content and maps. For most multiplayer games, the amount of modes and maps are paramount to it’s success. Not only that, Nintendo was limiting each mode to use just two maps per day. What sort of madness was this?! Well, after putting in a ton of time into this game, I can finally say the map count hasn’t been as big of an issue as I thought it would be. In fact, it doesn’t bother me. Personally, I think that speaks volumes of how great and fun the core gameplay is. The core mode for Splatoon is called Turf War, a 4v4 match where teams try to ink more of the map in their color. Taking out the enemy isn’t a priority like in the other games, though knocking them out does eliminate someone capable of covering your color for a few seconds at least so there is some strategy at least. The main focus of players is to shoot their gun and cover the ground with their team’s color, where at the end of three minutes, a fat cat will announce who’s color occupies more of the map. Sub weapons, item slots, and “super” abilities also make up the loadout for each player. Where the genius aspect comes in is that each match is only 3 minutes long. It feels like the perfect time limit giving the players enough time to duke it out without the match feeling stale or overstaying it’s welcome. I’ve also found the game to be extremely well balanced where level 1 characters can be competitive with level 20 players. Even though players are battling on only two maps, the gameplay of using ink to cover the ground is extremely addicting and downright fun. For me, it’s a tough game to put down. Level 10 unlocks the ranked mode which offers up a completely different mode called Splat Zones which is a completely different take on a typical king of the hill mode in other shooters. 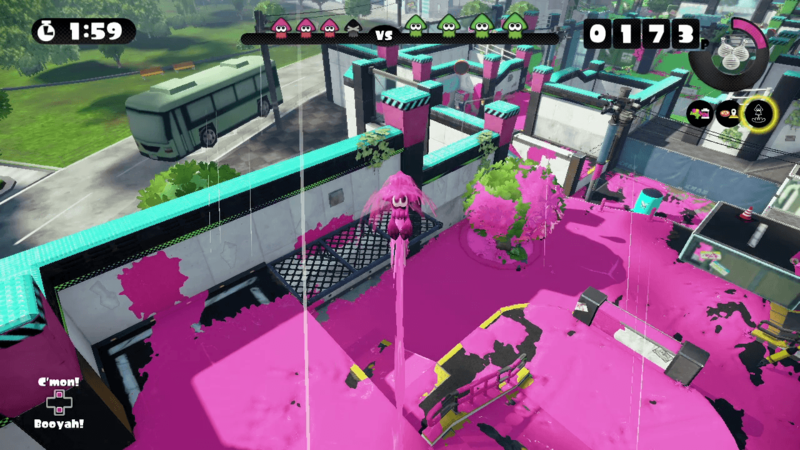 Basically, both teams fight over a piece of the map by covering it with their ink color for a designated amount of time. It plays very differently from the typical Turf War matches as players not only want to ink the highlighted space, but taking out enemies is more of a priority than it is in the other mode. Customization is also paramount in Splatoon as a number of shops allow players to switch out gear including shoes, headgear, and shirts. Players also have access to a number of weapons ranging from more close quarters to longer ranged. There’s enough variety here to let players experiment with how they like to play. I’ve also been really impressed with Nintendo’s dedication to keeping the game fresh with new (and free!) content almost on a weekly basis. Since launch, they’ve added a few more maps to the rotation along with new gear and weapons. That trend doesn’t appear to be stopping any time soon along side bigger DLC later in the summer. The other big surprise for me was with the game’s single player offering. As Splatoon was marketed primarily as an online shooter, I found the single player to be well made and compelling, if not a tad bit short. This campaign offered a completely different look at the game, focusing more on platforming elements rather than shooting your colored ink all over the ground. As in some of the recent Mario titles, each stage presented a new technique they’d ease you into such as using ink to reveal invisible platforms or using ink geysers for platforming and combat. It’s fun and a welcomed change of pace if you do get tired of making messes online. Sure, the game isn’t perfect, but that’s to be expected considering this is Nintendo’s first really attempt at creating an online focused experience. Some modern features which have been staples in other shooter style games are curious absent here, such as being able to back out of a match when looking for additional players or even being able to customize your loadout prior or before a match. Players who want to swap weapons will need to do that before going into a match and are stuck with that loadout until they exit the online portion. Still, these are small nagging issues that didn’t negatively hinder my experience. They’re also small enough that they could probably be fixed via an update as well. One of the bigger missing elements may be the fact that the game’s only local offering is a 1v1 balloon popping battle mode. Sadly, two players cannot go online together on the same console making local multiplayer options limited. Quite simply, if you own a WiiU, Splatoon should be in your collection. Don’t let the low content dissuade you, this is an incredibly fun game that I’ve found to be highly replayable. With Nintendo constantly updating the game with new maps and weapons and with bigger content coming later this summer, Splatoon is sure to keep you inking up landscapes for months to come. This entry was posted in Opinion and tagged games, Opinion, WiiU. Bookmark the permalink. I can’t stop playing Splatoon. I have been at it for a surprisingly huge amount of time, and even though I have purchased all weapons that are currently available and reached level 20 I just keep going because it is a lot of fun. Nintendo struck gold with this formula. Good news for you is that a brand new game mode is releasing tomorrow. Looks like a ton of fun. Yeah, I saw that! I am looking forward to playing it. Hmm…been looking for something to replace Destiny for online fun. Maybe this is the game to try. It sounds like a blast! That 3 minute time limit for matches is really appealing! I mean, a multiplayer mode that I *don’t* have to set aside a couple hours for just to play a handful of matches? Sign me up! Exactly! 3 minutes is definitely the sweet spot, but I find myself saying “One more game” quite a bit. It’s a ton of fun and definitely a worthy addition to the WiiU library even with those minor issues. Good news is that Nintendo is adding a brand new game mode tomorrow for free!